Input: Either from a Google Chromecast or a Tivo to an LG TV (2009 model) via HDMI. Amplifier: The LG TV is connected to an FX Audio 802 class D amplifier via TosLink (optical link). Subwoofer: The SA70 provides an amplified low frequency signal to a Voxel subwoofer as designed by Paul Carmody. Speakers: The SA70 also passes a full spectrum signal through to a pair of Quarks as designed by Jeff Bagby. If you want to build your own pair of Quarks, I recommend the kit from DIY Soundgroup. Playback Control: Our “Tivo Slide Pro Remote” had no problems learning the Mute/Volume up/down buttons from the FX Audio 802’s remote. All other controls are done through whatever application you use to stream data to the Chromecast or the Tivo remote if the Tivo is the input source. After hooking everything up, to my dismay I had to discover that I got a fairly audible hum from the Voxel. It sounded almost like a ground loop. But the TV was connected to the class D amp via an optical link and the class D amp has an external power brick and there is no ground connected to it, so in theory it should “float”. Therefore I didn’t expect a ground loop. The next thing I tried was to disconnect all input and output from the plate amplifier (of course with the exception of the signal going to the subwoofer). Unfortunately the hum was still present as soon as I turned on the plate amplifier. — Also, trying an other outlet didn’t solve the issue. I was pretty sure it was not an issue with our home’s wiring, since we had the entire wiring checked out by a licensed electrician a while ago, as part of some work we had done. Adjusting the gain on the plate amplifier had no effect on the volume of the hum, so it was probably not something stray it picked up form an unconnected input. At this point I started to mentally compose an email to Parts Express to RMA the plate amplifier, but I decided to give it another try. I turned on the main amp and the TV which was tuned to some random cable channel. There was definitely bass coming from the subwoofer, so everything was working as expected. I don’t know for sure, but here is my best theory: The power plug of the SA70 has no ground pin. I didn’t check, but I think the plug is reversible. And when I reconnected everything I might have reversed the plug and hence switched neutral/live wire. The first thing you want to do is to disable the equalizer on FX 802 amp by setting it to “Flat”. There are various theories as to whether or not speakers need a break-in, so I think I’ll revisit this in a while. UPDATE (4/6/2017): This turned out to be too “boomy”. Here is a post on what I finally settled on. 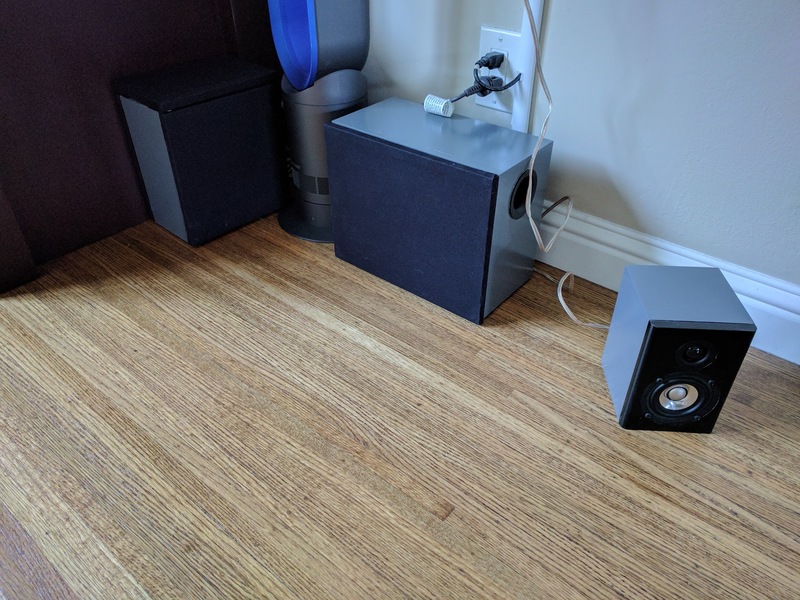 Since I had previously listened to just the Quarks, I focussed on the subwoofer this time and how it blends in with the main speakers. First, I gave the Voxel a few “kicks“, courtesy of http://www.audiocheck.net. Then I searched for “subwoofer test” on Youtube and found this. It sounds quite impressive in our small sitting area on the Voxel. I did not expect bass going that deep from a subwoofer that is about the size of a shoe box. Another thing I listened to was Maurice Ravel’s Bolero, because it features different instrument groups and is a slow, 15 minute crescendo with a finale that features timpani and other kinds of drums and the entire orchestra playing during the finale.